I know, it’s been cricket city around here. And then two posts in one day? Whatsupwitdat?? But in my real life things have been going a mile a minute… it’s been crazy. Good crazy. The China trip was huge. Wonderful and amazing. And heartbreaking. But that’s a post for another day. Our fledgling business, Wild Olive, has been incredibly blessed since our virtual ‘doors’ opened two months ago. We’ve had the opportunity to donate a percentage of profits to Show Hope. How cool to be a part (albeit a small part) of helping a child come home from China? We’ve now changed our ‘give it!’ charity to Love Without Boundaries, a foundation that needs no introduction in the adoption community. We’re thrilled to be able to help support another charity that is so near and dear to our hearts. We’ve also launched another vehicle for helping others: a charity tee. Our very first charity tee is now officially available in our store. 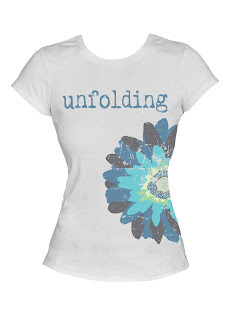 ‘Unfolding’, based on a verse in Philippians, is a whole new look for Wild Olive. And we’ve created not only one, but two versions, just to be sure everyone can find a color/cut combo to suit their tastes. This shirt was inspired by MckMama and the recent hospitalization of her youngest son, Stellan. A percentage of the proceeds will benefit families like the McKinneys who are enduring separation due to hospitalization through Until Journey’s End. You are sweet and amazing! AND so inspiring! I pray that one day we will be able to meet in person! I am truly LOVING the new design – going to have to check it out 😉 Hope all is well ad that you are having a great week! Yes, they are beautiful! I must have one! Girl! What are ya doin’ to me!? Another great tee! My husband didn’t complain until my 5th one came in the mail! I’m gonna have to hold off a bit…or time it just right so that he isn’t home when it arrives! BUT I LOVE the newest design! 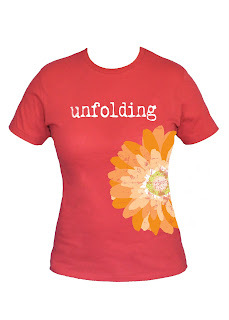 LOVE the unfolding tee’s. I also love that you guys give back. Can you do me a favor and e-mail me about the color of the chili t? I have auburn red hair and can’t wear some colors as it really clashes with my hair. Oh my goodness !! Ya’ll did it – Very cute t-shirts. Can’t wait to grab me one.